Discover how you can heal your body and lose 10 pounds or more in the next 30 days! That's exactly what happened with me. I was lucky enough to discover the keto diet several years ago. From that point, I have been more mindful of everything I put in my body, and by mastering the process, the results simply took care of themselves. One scientific study found obese patients lost 13.6 kg (30 pounds) after two months on the keto diet and that more than 88 percent of patients lost more than 10 percent of their initial weight by the end of the study, while lean mass was practically unaffected. The exact macronutrient breakdown to spearhead your weight loss on the keto diet! Think you can't be a vegan and on the keto diet? Wrong! Learn exactly how to do "vegan keto"! The easy way to reach optimum ketosis to help you lose even more weight! The 10 proven steps to not ruin keto during the holidays! The truth to FAQs about the keto diet! Revolutionary answers to the 14 biggest keto myths! This audiobook literally shows how all your excuses are simply you procrastinating on changing your life, you trying to defend your terrible eating habits. There are no excuses left, it's down to you to change your life. So, if you finally want to revolutionize your relationship with food, then click "Buy Now"! If you’re looking to save time on research,I’d recommend this book as it for author’s done it for you. Great book for beginners to learn about Keto! 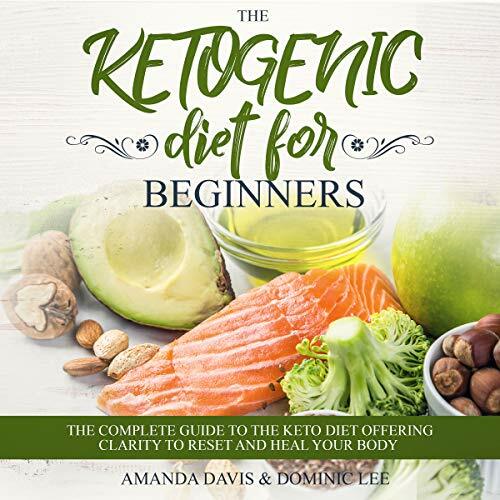 This book gives a great overview for anyone thinking about trying the Ketogenic diet. All the complex points are broken down into easy to understand "bites" and it takes something as scary as a lifestyle change, like the Keto diet, much more approachable. - Highly recommended! Definitely one of if not the best Keto beginners guide I've read, I loved how it tackles the challenges you will face, and approaches weight loss as a lifestyle change instead of a short term fad, highly recommend to anyone looking to lose weight out there. If you want an awesome introduction to the Ketogenic diet, then quite simply, buy this guide! Gave me everything I needed to finally get started with the Keto diet to (hopefully) lose even more weight! Covers everything you need to get started on the Keto Diet from the challenges you will face to the benefits you will get as well as a meal plan to even help you get started- is definitely going to help me on my keto journey! Awesome introduction to the Keto diet, showed me exactly how to finally get myself into gear and get started with Keto, like the book shows you how its time to take my weight loss to the next level! Yes, this is an awesome beginners guide, but even more than that it has something for anyone interested in Keto and offers a wide array of strategies to to optimize the Keto diet and take it to the next level, can highl;y recommend to anyone looking to lose weight and anyone involved in Keto. Loved this beginners guide to the Keto diet, covers absolutely everything needed to get started with the KEto lifestyle and how to take your weight loss to the next level, if anybody is looking to lose weight- buy this book. Very happy with this book, covers all the essentials regarding the Keto diet, and even gives a nice 30 day meal plan to any true newbies out there, would recommend to anyone with an interest in the Keto diet or looking to get started. A great guide for all things Keto! Really helped me grasp the basics of Keto as I'd never heard of it before! Walks you through how to take control of your relationship with food and I've started to see the difference with my weight in such a short amount of time! Great book! I have been researching the keto diet for a few weeks now, this book really helped explain every single question I had regarding it. I Will be recommending it to my friends for sure.